A defining feature of Judaism, Christianity, and Islam is that they are more or less explicitly logocentric, word-centered. For all three of these religions of ethical monotheism, God is understood largely in terms of Logos, the Greek word for reason or word. Thus the Word as Law defines Judaism; the Word made Flesh is central to the Christian understanding; and the Word as the Will of Allah is a major feature of Islam. All of the world’s great religions to one extent or another give priority to written texts: the Vedas and the Upanishads of Hinduism; the various Buddhist texts in pali or sanskrit, the commentary traditions in philosophy, to give but a few instances. There is something inescapably significant about written texts, the scriptures and the writings of religion and philosophy. This calls attention to the mystery and the wonder of reading and writing, one of the most profound of all human abilities and one which speaks to the idea of civilisation. The ancient Sumerians were among the first to do so many things practically speaking in terms of technology that gave them a power over nature: such things as sailing – using wind and therefore not necessarily determined by the flow of water; irrigation – being able to redirect water to where it can be used for agriculture; and a host of other practical inventions. But perhaps the most important invention was writing: cuneiform script, wedge-shaped marks in clay, that probably originated in a warehouse. Why? There is a necessary connection between numbering and naming things which then leads on to stories and ideas. Reading and writing signify civilisation. “Whatsoever things were written aforetime were written for our learning,” St. Paul famously says. He is referring to the Hebrew Scriptures but paradoxically his remark will extend to the inclusion of his own writings which comprise the greatest part of the Christian Scripture, the New Testament. What is written is written for our learning. This speaks to the prominence and the significance of reading and writing, to the significance of books. This is a particular concern and challenge for our age as Maryanne Wolf wonderfully explains in Reader, Come Home: The Reading Brain in a Digital World (2018). Following upon the success of Proust and the Squid (2008), she has written an engaging book about what has transpired in the last ten years in terms of neuroscience and the impact of the digital culture on our reading. Far from being a technophobe, she nonetheless seeks to alert us to the dangers of losing the capacity for “deep reading,” for a kind of collectedness, “a place of stillness,” that belongs to Aristotle’s idea of contemplation as the highest form of human life. This complements the theme of our attention to ethical principles which alone can properly shape our lives. Sitting and listening like Mary is necessary for Martha’s activity, too. Without it, we are the endlessly distracted in a culture of distraction, unable to focus and at the mercy of digital overstimulation and manipulation. The theologian John Dunne notes that wisdom is “but contemplation in action.” Wolf wants to show this in part through literature and philosophy and in part through neuroscience. It is all about the turning but what kind of turning? Head over heels? Like a rolling stone? Or a November snowball? No. It is about God’s turning to us and our being turned to God. That is the especial wonder of this Sunday. I love the collocation of prepositions: “next” and “before” that signal an ending and a beginning. This Sunday speaks so profoundly to the double movement of the spirit: God coming to us and our coming to God, to the principle of justification in the first and the principle of sanctification in the second, and to the way in which those necessarily intersect. We have in today’s lesson from Jeremiah a kind of summa of the pageant of sanctification. It is really all about “the Lord our Righteousness” living in us and we in him. In the textus receptus of the New Testament, this is one of the few but important passages that are re-printed in majuscules, in capital letters. 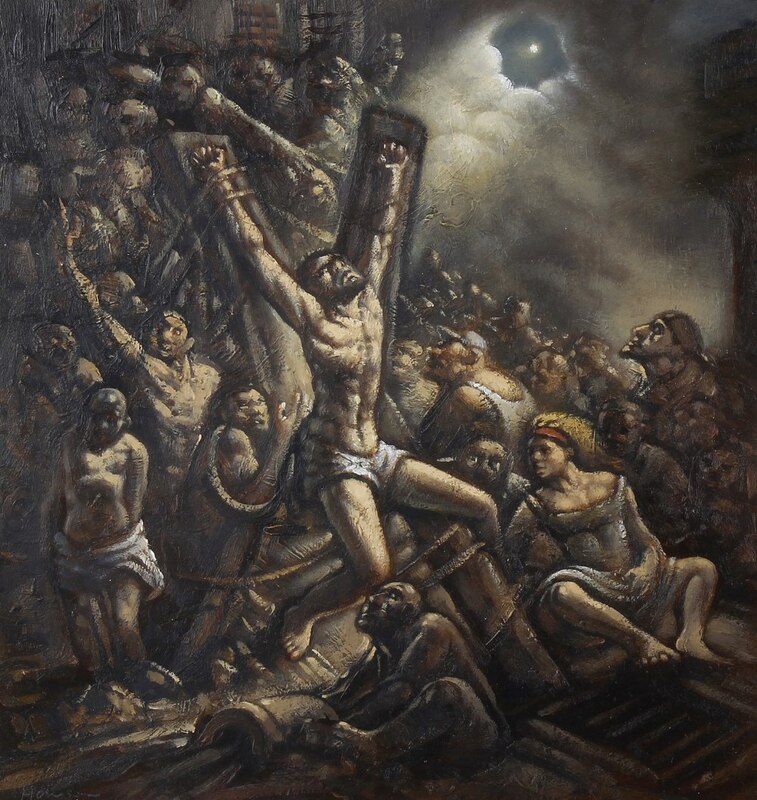 It is a kind of shout-out, a way of calling attention to the whole pageant of sanctifying grace as being about the realisation, bit by bit, of justifying grace dwelling in us. It recalls us to a new beginning, a beginning again in the pageant of that justifying grace towards us and its dwelling in us. It is all about the forms of our incorporation into the life of God in Christ. That belongs and marks the apocalyptic nature of Advent and of all that follows right through to Trinity Sunday. Something has to be made known to us even as we recognise our need for an ethical and spiritual principle. Left to ourselves we are dead and deadly. Such is the darkness of Advent into which comes the light of Christ. To speak this way about the pattern of the church year may seem linear, a step-by-step kind of thinking but really this Sunday shows us that is not so. It is more about a kind of circular reasoning (understood positively and essentially), a way of returning and turning back again upon the very principle of life and thought and being. A way of being of gathered into what is eternal. “Never that which is shall die,” a fragment from the ancient Greek Tragic poet, Euripides, states. What truly is truly remains. What is that? It is about Christ and about Christ in us, about how our lives participate in the life of God. ($15.00 – concert; $ 20.00, pulled-pork supper & concert). 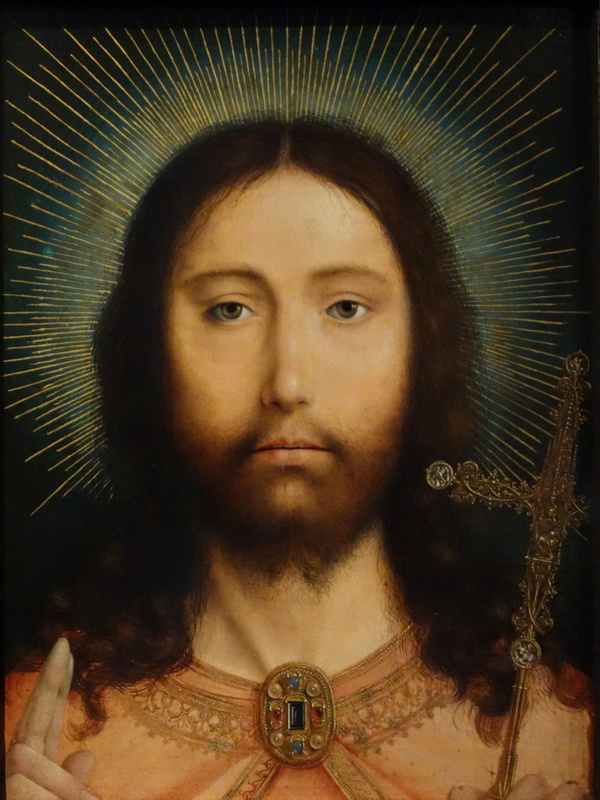 Artwork: Quentin Matsys, Salvator Mundi, c. 1510. Oil on panel, Royal Museum of Fine Arts, Antwerp. 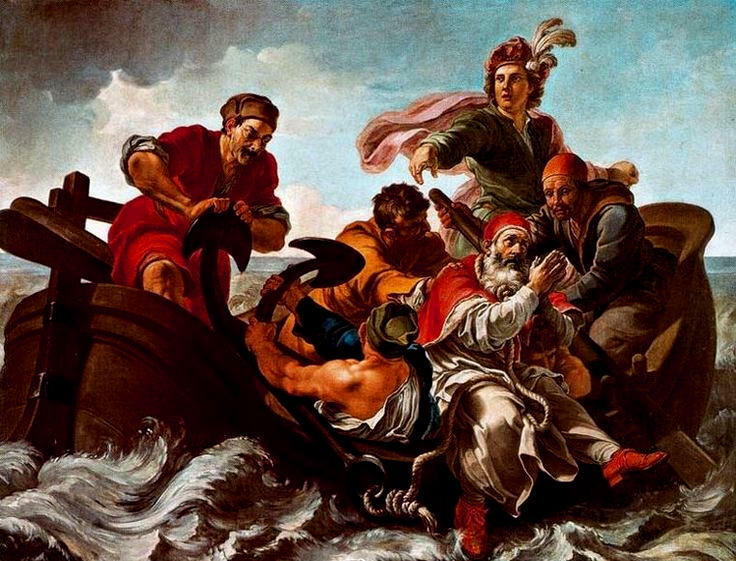 Artwork: Pier Leone Ghezzi, Martyrdom of St. Clement, 1726. Oil on canvas, Pinacoteca Vaticana. 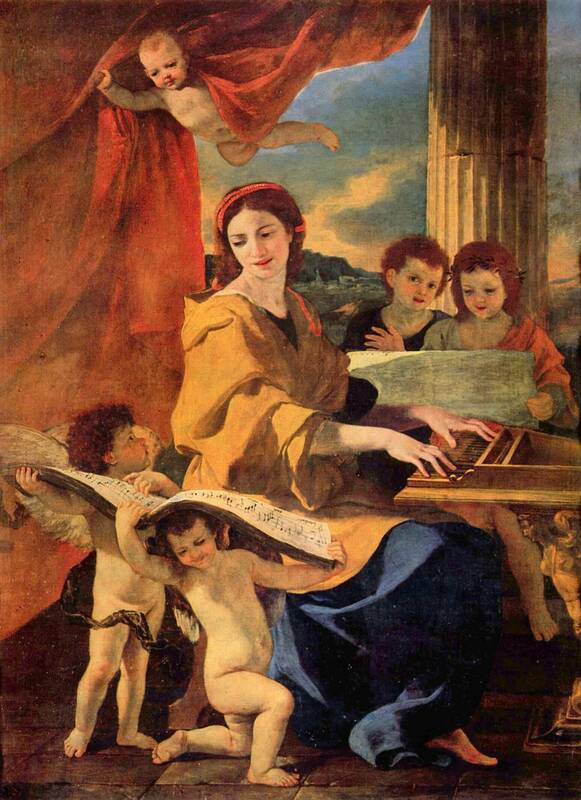 Artwork: Nicolas Poussin, St. Cecilia, c. 1635. Oil on canvas, Prado, Madrid. Martha and Mary represent action and contemplation respectively and belong to a long and rich tradition about the forms of spiritual life. Following Plato and Aristotle, contemplation is the highest form of human activity, an inner activity of spiritual and intellectual reflection, but that is not at the expense of outward activity which belongs to our lives physically and with one another. There is, after all, something spiritual, intellectual, and ethical about our interactions with one another, even necessary. At issue is the interplay between action and contemplation; in short, between Martha and Mary. I am often struck with the ‘counter-culture’ aspects of our School in such things as Chapel, especially with such things like the story of Mary and Martha. It challenges the assumptions and attitudes of our culture. That is an important feature of religious philosophy. There is no greater contrast than between ‘being distracted’ and ‘being collected.’ That is the challenge of the story of Mary and Martha which connects powerfully to the theme which we have been exploring in Chapel about our recognition of a need for an ethical principle that shapes and governs our lives and that is alive in us. The story of Mary and Martha follows directly upon the parable of the Good Samaritan. That is intriguing and suggestive. Is the story of Mary and Martha the counter or the complement to the concluding injunction of the parable to “go and do thou likewise” towards those in need? We are, it seems, to act with compassion rather than indifference towards those who are suffering. That might seem to imply the priority of action over contemplation. Edmund was raised a Christian and became king of the East Angles as a young boy, probably when 14 years old. In 869 the Danes invaded his territory and defeated his forces in battle. According to Edmund’s first biographer, Abbo of Fleury, the Danes tortured the saint to death after he refused to renounce his faith and rule as a Danish vassal. He was beaten, tied to a tree and pierced with arrows, and then beheaded. His body was originally buried near the place of his death and subsequently transferred to Baedericesworth, modern Bury St. Edmunds. His shrine became one of the most popular pilgrimage sites in England, but it was destroyed and his remains lost during the English Reformation. The cult of St. Edmund became very popular among English nobility because he exemplified the ideals of heroism, political independence, and Christian holiness. The Benedictine Abbey founded at Bury St. Edmunds in 1020 became one of the greatest in England. Click here to read Fr. 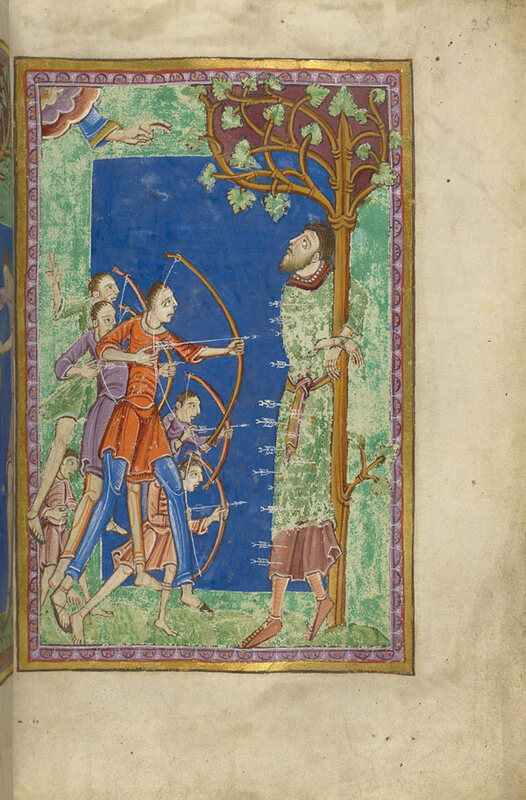 David Curry’s sermon for the Feast of St. Edmund. Artwork: Martyrdom of Edmund of England, Illuminated Miniature from The Life and Miracles of St. Edmund, c. 1120. Made at the Abbey of Bury St. Edmunds in East Anglia by the Alexis Master of the St. Albans Psalter. The Morgan Library and Museum, New York. For the Most High knows all that may be known. The rubric or direction on the bottom of page 258 (BCP, Cdn.) explains today’s readings. Sometimes the Trinity Season runs beyond twenty-four Sundays, sometimes less, so what happens when it runs over? It is a question about the distribution of the Sundays and about the appointment of the readings. There is a wonderful logic to the way in which the Trinity Season and the Epiphany Season complement one another, the one longer or shorter as the case may be. This year the Trinity Season runs to twenty-five Sundays. In the New Year, Epiphany Season will run to five Sundays. Note that from the rubric, what is read today are the readings appointed for The Sixth Sunday after Epiphany. Thus there will be no duplication just a marvellous liturgical and scriptural sensitivity through which time is continually gathered into eternity. These provisions are a post-Cranmerian development. They belong to the work of John Cosin, the Bishop of Durham, who in the middle of the 17th century undertook to make provisions for what was missing for certain Sundays in some years in the lectio divina, the divine reading of Scripture at Mass on Sundays. He appointed readings for the 5th and the 6th Sundays after Epiphany, a season which like the Trinity Season is variable in length owing to the movable date of Easter, which would also serve as the readings for the 25th and 26th Sundays after Trinity when needed. In other words, they do double duty. And, taking his cue from Cranmer, he composed the Collects as based on the Scriptural texts chosen for those Sundays. You can see how this morning’s Collect draws explicitly upon the Epistle and the Gospel. All this offers a wonderful theological insight into the reason for our reading the passages appointed for The Sixth Sunday after Epiphany on The Twenty-fifth Sunday after Trinity. They bring us to next Sunday, The Sunday Next Before Advent. How appropriate because we hear in the Gospel reading that “they shall see the Son of Man coming in the clouds of heaven, with power and great glory.” That signals an Advent theme captured in the Advent Hymn, “Lo, he comes with clouds descending” (Hymn # 60).